Well after biting the bullet and factory-resetting our Lumia 900 with a ROM flash, we managed to update our glossy-white AT&T Lumia 900 to the official Tango update. That update is sitting in stand-by on Nokia’s servers, presumably waiting for AT&T to give the go to push out to the Zune servers so the rest of you can update. Although you can manually do this yourself using a third-party program called Nokia Care Suite, you will factory-flash the phone meaning the device will be completely wiped—no saved games, no saved photos. In that regard, you may be best served by just waiting a few days (weeks?) for it to hit Zune where you can just update the phone and keep everything. One of the biggest-small things we were happy to notice is that the capacitive buttons now stay lit on the Lumia 900. Going back to our initial review of this phone we noted how those lights would turn off after about 3 seconds, presumably to save battery power. It was odd because Nokia didn’t do that on their Lumia 710 or 800. (Of course, this may have happened with the previous update, so forgive us if we’re just noticing now). As expected, apps like Contact Share and Counters fully work with the new firmware on board. (Note: in the video, I erroneously mistake Contact Transfer with Contact Share; the latter does work though). We hesitate to factually say all the above is better and for all we know Nokia engineers are chuckling, noting how they didn’t touch half of those things. But we’re feeling somewhat confident in stating that the camera is performing better than before. The Lumia 900 camera is still not awesome but it may let us rethink using our Titan II for a few days to try in more every-day-life situations. We still recommend you put Contrast to High but don't touch Saturation. The latter will turn your photos to Day-GLO and will look just terrible. We’ve tossed up a few sample pics below if you want to gander and judge for yourself. Flip to silence? The ability to flip the phone to silence the ringer is a new feature that Nokia is touting on its Lumia line. We have not found the option for it but we also haven’t tossed in our micro SIM yet (our Titan II use regular SIMs, which means an adapter which means minor “surgery” to remove it). Edit: It is evidently an 'always on' function so there is nothing to enable. Nokia also promised that with this firmware update for their phones that screen brightness (and corresponding color rendition) would be improved. The screen does seem to dim down quite a bit in regular room light which we appreciate—it both saves battery and our eyes from strain. The proximity sensor is also said to be improved though that’s a bit more finicky to test. Tango also brings multiple photos in MMS and the ability to attach voice-notes, both of which are present in this ROM of course. Other than that we did not notice the GPS-service icon on at all though we’ll look to see if it appears in regular use, nor did we notice any new features or apps from before. The OS still feels fast and we have no initial complaints though we’ll be sure to share them later on if we notice. The update feels solid and while there seem to be many minor fixes they are certainly welcomed. Update: As asked in comments, how is the volume rocker? Specifically, when the device is in standby the buttons wouldn't always work or they would require a double-tap. From our intial tests they do now work as expected--one tap immedilatey turns them up and vice versa for turning down. 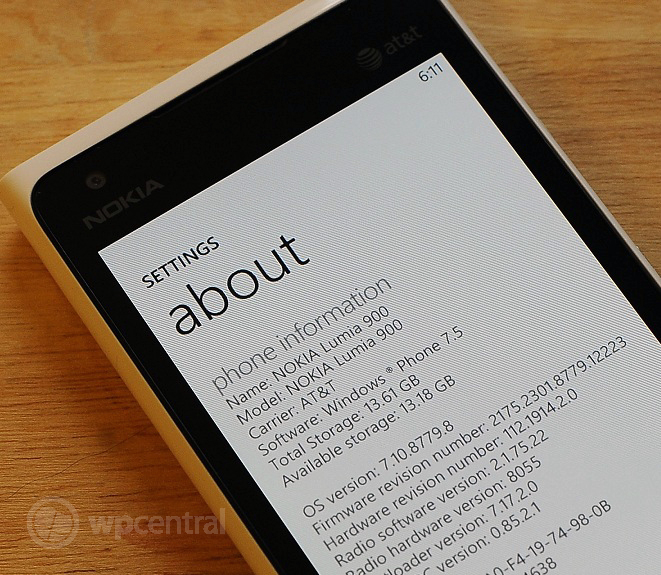 Did you flash your Lumia 900 with the Tango update? Notice anything we missed? Let us know in comments and we’ll add it to this story.